It’s always nice to get away from pollution and work-related stress from time to time. The refreshing sound of water and the warm scent of nature simply heals. You can always choose the beach to hang out at, but if you prefer a rather greener view and to be close to the mountains, you might also want to go on a hike to the mountains. The Hagoromo Waterfalls (Hagoromo-no-taki [羽衣の滝]; Hagoromo Falls or “Angel’s Robe Falls”) sits on the western side of Daisetsuzan National Park in Tenninkyo Gorge. The name Hagoromo means “feathered robe” or “celestial robe” depending on various sources. Garo Falls, also called “Flying Dragon”, earned its name from the legend of a dragon king protecting the Matsumae clan’s treasure. With no basin, it often creates rainbows due to scattered waters always hitting the ground. It is best to go there during May or June or when autumn starts. 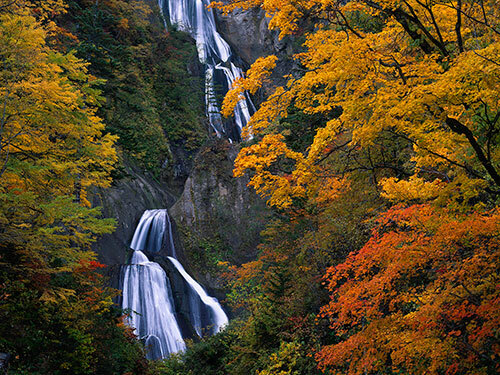 The Ginga and Ryusei Falls are often referred to as the “Husband-and-Wife Falls”. What makes this twin falls stand out is the huge rock that bulges out in between the two waterfalls. If you want to have a less crowded and more peaceful waterfall experience, this is one of the best places to go to. 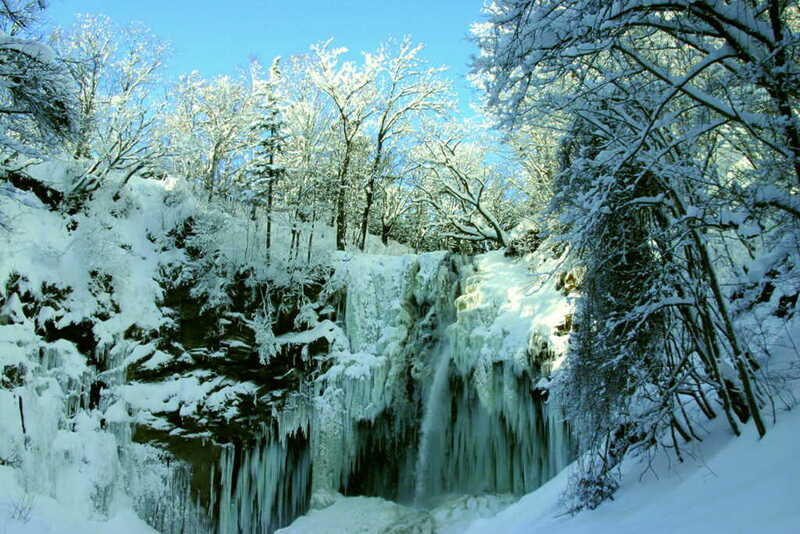 Found in Saporro, Ashiribetsu Falls is mostly attractive during winter due to its magical setup. The water turns almost frozen which creates a daunting look that both local villagers and tourists love. Oshinkoshin Waterfall flows like a wide cape and has an elongated tree-covered rock in the middle that creates a small split. The water makes its way into the Sea of Okhotsk not far from the falls. It is found near Shiretoko National Park, Hokkaido Prefecture. 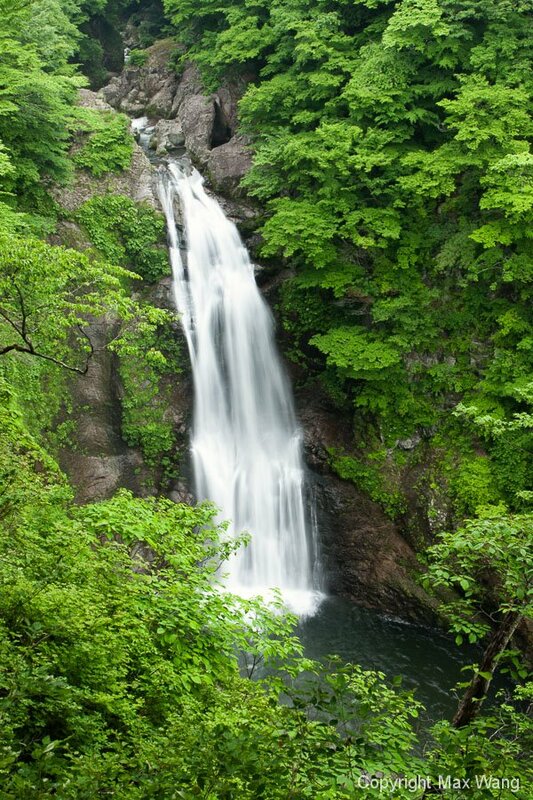 Also known as “Black Bear Falls”, it is located in the town of Ajigasawa, Higashitsugaru District Aomori Prefecture. The waterfalls is regarded to be an object of religious veneration due to its shape resembling an image of Kannon Bosatsu with hands clasped in prayer. It is also thought to resemble a standing bear, hence its literal translation. Matsumi Falls is a waterfall in the city of Towada, Aomori Prefecture, Japan, on a tributary of the Oirase River, which flows down from Lake Towada. It has a curvy shape that flows majestically downstream and gives an awesome view. Fudo Falls is found in the city of Hachimantai, Iwate Prefecture on a branch of the Api River in the Tohoku Region. There are actually, confusingly, two Fudo Falls in Japan! The other is in Gunma in the Kanto region and takes 2.5 hours to reach if driving from Tokyo. However, the Tohoku Fudo Falls is regarded as one of the most beautiful in Japan, and if you are in Tohoku, you should make time to visit it! The Akiu Falls is a waterfall found on the outskirts of Sendai towards the northern part of Honshu in the Miyagi-ken (Miyagi Prefecture). It has a height of 55m and is said to be one of the three most beautiful waterfalls in Japan. Sankai Falls is a 3-layered waterfall located in Zao, Katta District, Miyagi prefecture. The water comes from Sankaitaki River which is also a tributary to Osaru river. More than half of this list can be found in Hokkaido, and for sure you won’t miss the adventure. So, what are you waiting for? Pack your bags and be ready to fill your Facebook and Instagram with amazing photos (and selfies)!